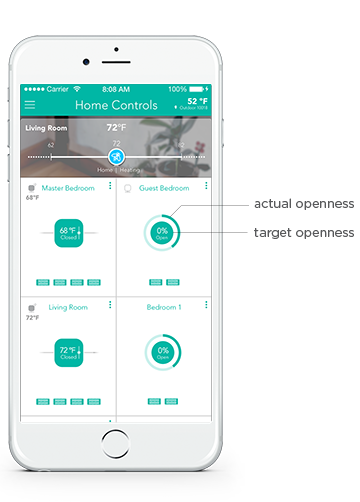 The Keen Home app's Home Controls page has two different indicators of the vent's openness. The percentage in the middle of the circle is your 'target' openness, meaning what you last set the vent to. The shaded ring around the vent represents the 'actual' openness, and should always match approximately how open the vent is. There are a couple reasons these two indicators could differ from one another. For example, if you have a schedule set for the room, the vent will close to 0% at its scheduled unoccupied time, but the percentage in the middle will stay at what you last set it to. Then when it's time for the next 'occupied' period in the scheduler, the vent will open back up to your last-chosen percent. Another reason they could mismatch is if the vent has become disconnected. The percent may show your desired target, but if the vent is offline, the ring may not update accordingly. A good way to check this is to send the vent an open or close command and see if both the target (percent) and the actual (the ring) move accordingly.